The Philippe Briand Yacht Design studio has come up with the design of the Briand 140, following a request from a European customer who wanted a performance luxury sailboat that is comfortable and elegant at the same time. The design follows the indications of the customer and the result is this yacht, the Briand 140 which guarantees high performance also with moderate winds, thanks to slight displacement and a waterline length of 39.50 m. The Briand 140 is equipped with a sloop rig, it has a 50 m mast and bulb keel with adjustable stabiliser fins. Inside there is a spacious living area mid-ship with a low, sleek deck house as well as a TV lounge and corner bar. The whole area mid-ship is lit by the wide windows of the deck house. The crew's quarters are towards the stern while the owner's cabin is located near the bow. The deck is the flush-deck type with a streamlined, modern profile characterised by harmonious, matching lines. Outside, the stern area includes the helming station and an outdoor saloon, the whole well sheltered by the side extension of the deck house. 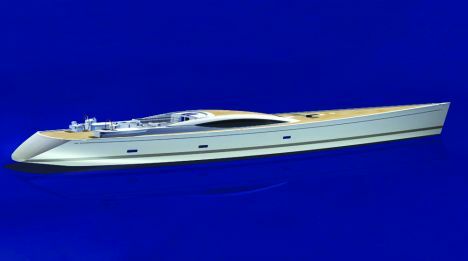 For further information please contact Philippe Briand Yacht Design; 26 Rue Saint Sauveur; 17100 La Rochelle (France); tel. +33 5 46505744; fax +33 5 46505794; e mail philippebriand@compuserve.com; web-site: www.philippebriand.com. Sail surface (spanker and genoa): 817sq.m.